I’m the proud owner of two Beagles, Atticus and Scout Haltom, who are obviously named after my two favorite characters from my all-time favorite novel, To Kill a Mockingbird. I absolutely adore Atticus and Scout. When I come home from the office at night, they greet me as if they have not seen me in years. When I pull into the driveway, they race to meet my car. They then circle the car several times in a mad dash of frenzied happiness. When I get out of the car, they run up to me and immediately flop over on their backs so that I will rub their tummies. And when I do so, they are, to borrow a line from Huck Finn, just as content and happy as if they were on salary. Before the Lord sent me the Beagle brothers, Atticus and Scout, I was the proud owner of another wonderful Beagle, Cuddles. Cuddles was not as hyper as Atticus and Scout. He did not race to my car when I pulled into the driveway. He was a peacefully content soul who would welcome me home simply by enthusiastically wagging his tail, and consequently he was good for my soul as well. Cuddles never talked and seldom even barked. Instead he would make direct eye contact with you with those sad puppy eyes and drink in every word you said. When I would come home at the end of a long and taxing day, I would sit with Cuddles and tell him all about it. He would kneel down at my feet with his chin resting on his front paws and look up at me, and his non-verbal message would be clear: It’s going to be fine, Bill. Cuddles is in Heaven now. While I’m not a preacher and I don’t play one on TV, I firmly believe that, as I believe all dogs go to Heaven. I love all dogs, but I particularly love Beagles. I’m convinced that Beagles are the greatest species of dogs God created, and Cuddles, Atticus and Scout are exhibits A, B and C.
But if you need further and more objective proof, I hope you watched the 139th Westminster Dog Show on Tuesday night. The Westminster Dog Show is the Super Bowl of dog contests, the Grandpuppy of them all. I never miss the telecast of the show, and so on a snowy, icy Tuesday night, I sat in my den in my favorite easy chair with Atticus and Scout at my side. The Westminster Dog Show features a number of extremely exotic dogs, most of whom do not look like dogs. They resemble some strange animal I used to see on the old TV show Mutual of Omaha’s Wild Kingdom. But there are a few real dogs in the Westminster Dog Show each year, and I always root for them to win. And this year, I had a clear favorite, Miss P, a beautiful Beagle, if that’s not a redundancy. Miss P has a wonderful heritage, as her great uncle, Uno, won the Westminster Dog Show in 2008. As Atticus and Scout and I watched this year’s show on Tuesday night, we had our fingers and paws crossed for the Beagle, Miss P. In fact, it was clear that both Atticus and Scout were both smitten with Miss P, who is absolutely gorgeous. It was an exciting evening as Miss P excelled in all aspects of the Westminster Dog Show competition including prancing, swimsuit, and talent, and was named Miss Westminster Congeniality. And then came the dramatic moment, the announcement of the ultimate award, Best in Show. The crowd at Madison Square Garden went wild, and the crowd in my den went even wilder, howling in delight. Atticus and Scout reared up on their hind legs so that the three of us could exchange high-fives. And then they flopped over on their backs so that I could give them celebratory tummy rubs. It was a great evening for Miss P, Atticus, Scout, and all the Beagles throughout the world. I am confident that Cuddles watched the event from Heaven on a large celestial big screen TV, and when Miss P was crowned Best of Show, he wagged his tail enthusiastically. 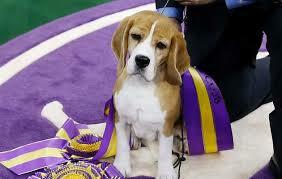 granite wholesale denver: This Beagles reign is finally back on with cuteness overloaded, yaay so happy for the beagles. The post is so cute the picture is cute too. I myself also absolutely adore Atticus and Scout, they are so love. cv writer professional: Both Atticus and Scout Haltom seem adorable right over here. They're looking like an excellent pair and very much active in their activities. I would love to have a day out with those little Beagles. Bart Haltom: City dogs vs country dogs! Bart Haltom: Sorry, but that dog won't hunt! Pretty dog, but that dog couldn't hunt a rabbit, much less a deer! Paul Solomon: If, by chance, Shirley McClaine is correct and reincarnation is real, then I would surmise that the most virtuous among us come back as dogs assigned to loving owners!